Happy Friday everyone, and glad to be back with you today! I'm calling this my mid-summer edition of 7 Quick Takes, because somehow it's already nearing the middle of July. This "time flies when you get old!" business is really kind of stinky, let me tell you. ;) This is generally the hottest part of the summer for us, now through mid-August, so usually it's my least favorite time of the year. This year, however, I've been enjoying the summer more and plus the weather has been beautiful and sublime. Now that I've said this, we will likely get a heat wave that will melt my car or something, but I'm throwing caution to the wind! So, what does this part of July look like in my summer? "I will make your eyeballs hurt if you stare at me too long..."
The color sequences are very short, meaning that the colors don't stripe, and have the potential to pool oddly. I'm hoping for a more staccato look, especially since the colorway is called "Confetti," but regardless, if they're bright and searing, Henry will love them. There are usually fall or winter babies upcoming when summer rolls around, and this year I am pleased to be knitting for Baby Gift Universe! This will be for Sheila's new baby, due at the end of August. It will be a Baby Surprise Jacket, which is just a classic and fantastical knitting pattern. You knit what looks like a baby blob, but when you fold it just so and seam it...WHAM! It's a baby jacket. :) It's quite an experience, you should definitely check out the photos on the site I linked to. As you can see from my photograph above, I'm using a yarn with long color repeats, so they will stripe, unlike Henry's socks. This jacket will be a combination of soft blue with milk, mocha and dark chocolate brown, perfect for either a little girl or little boy. :) I can't wait to get more of this knit and post update photos. 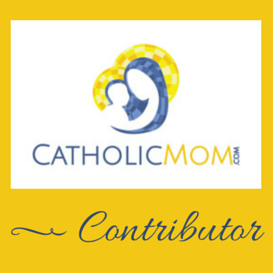 I am SO EXCITED about the book reviews that I have coming up on the blog. 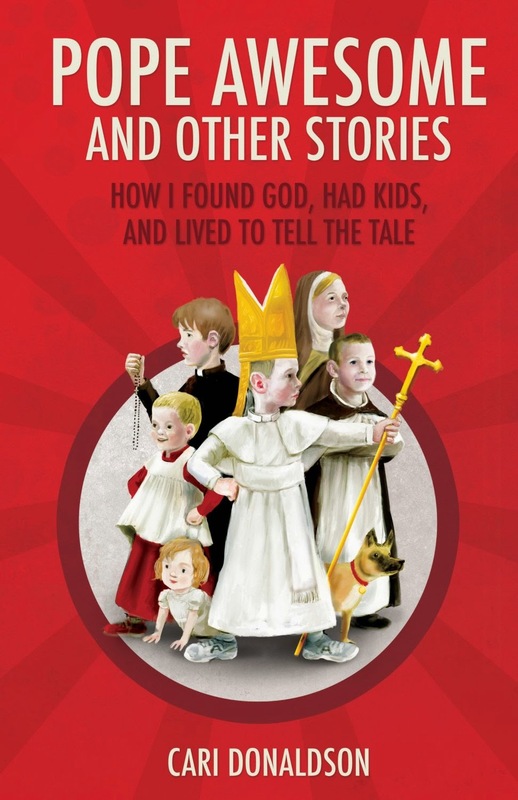 We have the official Catholic Book Club on July 23rd, with Cari Donaldson's Pope Awesome and Other Stories, and if the planets align, I'm hoping to have a Q & A with Cari about key moments in the book to post as well! The book is currently only $4.99 for Kindle, and there is still plenty of time to download and ready along! 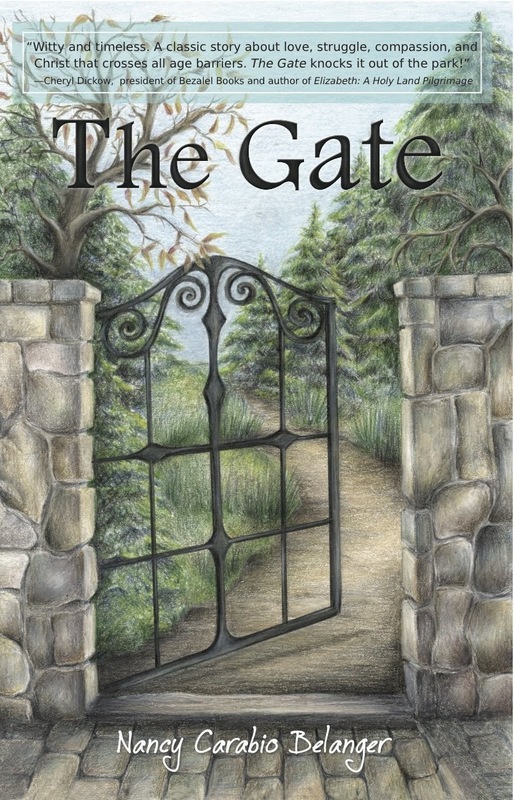 -6- Young Adult fiction bonanza! -7- But did I mention that summertime sleeping bites? There had to be one downer, right? :) Every summer the kids go to bed later, which is normal for a school-aged child Henry's age. He has to be up early during the school year, so an 8 pm bedtime. But in the summer it's much more free form, and the older he gets, the later he is permitted to stay up. Although we're still pretty strict on this, he's always up in bed before 9. But our daughter? She still needs plenty of sleep, but with how light it still is at 7 pm (her usual bedtime) here in the summertime, it just seems cruel to send her up to bed then. So I let her stay up a bit later, but Holy Moses does she take advantage. Last night I put her down at 7:30, and when I went upstairs following a shower, I could hear her calling to me from inside her bedroom. I go to check, and she informs me that she isn't sleepy. Are there any more terrifying words to a parent who is looking to unwind in the evenings? I read her another story and got her a sip of water. Put her back to bed. Within 10 minutes, I hear crying. Rinse and repeat about *3 more times*. Close to 9 pm, I'm getting Henry upstairs for our nightly saint story ritual, and ANNE IS STILL AWAKE. For the first time in the history of this tradition, Anne was included in the saint story ritual. Henry wasn't crazy about this development at first, but sweetly invited Anne to lay in his bed while I read the stories and offered her one of his stuffed animals to sleep with so that she wouldn't be scared back in her room. On to another summer weekend! What do you all have planned? 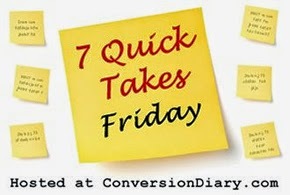 Head over to Conversion Diary for more 7 Quick Takes, and see you all on Monday! It's me again :) I'm sure you don't really want people pestering you for crochet/kitting advice, but I've been searching online for a while and can't find an answer to my question... How much can I expect cotton yarn to shrink, or how much larger do you make your dish rags than the desired size to allow for shrinkage? Do you crochet/knit them loosely, expecting that they'll tighten when washed/dried? Hope you can help me before I got my newest projects started :) And can't wait to see your projects in progress! 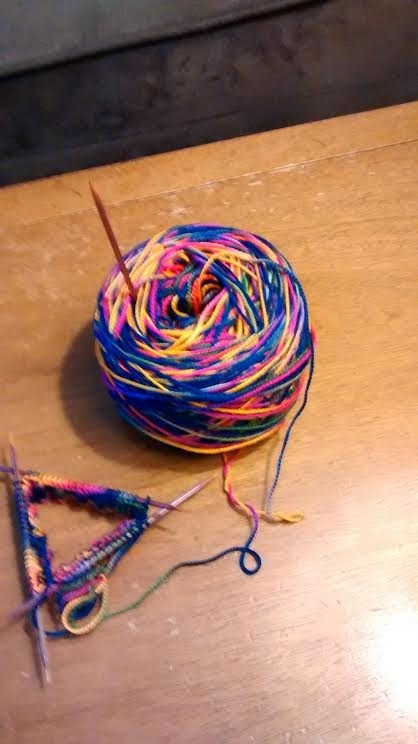 Random hypothetical question -- if someone gave you 100 yards of utterly unique yarn, would you know what to do with it? I have this problem of spinning rather small amounts, and I know most projects require a lot more. My current project to do with little bits of handspun are little wool diaper covers, which use about 75 yards or so, but not everyone has a use for those! 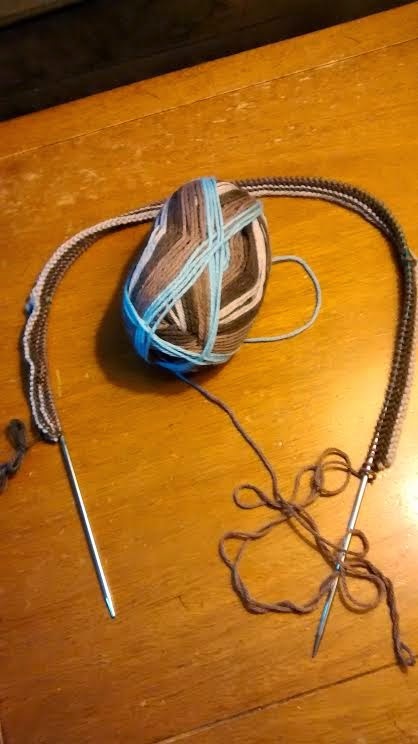 What would you do -- combine it with another yarn as an accent, or make a small project like a hat or toddler mittens or something? I just did that and wow, there are a lot of tiny (and adorable) projects!